Video players change the way the business gets marketed on line. Even small companies are rapidly increasing the use of online video. We at i95Dev use a custom-branded video player extension to deliver significant returns for potential customers. 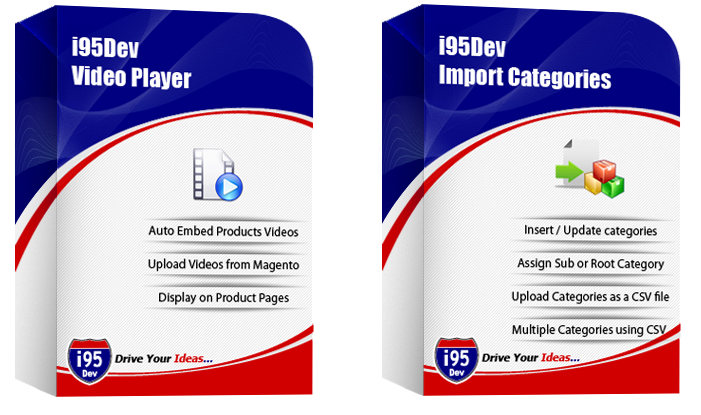 i95Dev Video Player extension allows your customers to view videos about your products. i95Dev Video Player extension is more than technological advancements. It is an easy-to-use online video platform for businesses. i95Dev video player makes it easy for customers to understand more about products by watching a video explaining the features in details. In this cut-throat competitive online market, importing trends are back on track.i95Dev Import Categories Extension enables to import categories as CSV files in Magento. Nowadays import options are being used for business operations.i95Dev import categories extension is a unique extension to create multiple import categories and also enhance users’ usage ability.